Peptic ulcers have become quite a common malady of late. This increase in the number of cases is a fallout of a variety of unhealthy and indiscriminate lifestyle choices. If you are one of those saddled with an annoying ulcer, worry not. Avoiding a few common aggravators and taking your prescribed medication on time will help you get rid of the agony unleashed upon you by ulcers. Having an ulcer of any kind in your GI tract can be quite an ordeal. Ulcers generally tend to have a sadistic streak. You may be sound asleep at night only to be jolted right out by a sudden scorching sensation in your rib cage combined with violent nausea, all thanks to that ulcer lodged somewhere in your GI tract. Home remedies like downing a cup of cold milk usually prove ineffective as an antidote for a GI tract that feels ablaze. Some common factors like high levels of constant stress, excessive and indiscriminate consumption of pain-relieving drugs (NSAIDs), smoking, and unhealthy eating habits that make one vulnerable to the Helicobacter pylori bacteria are prime reasons behind most GI tract ulcers. 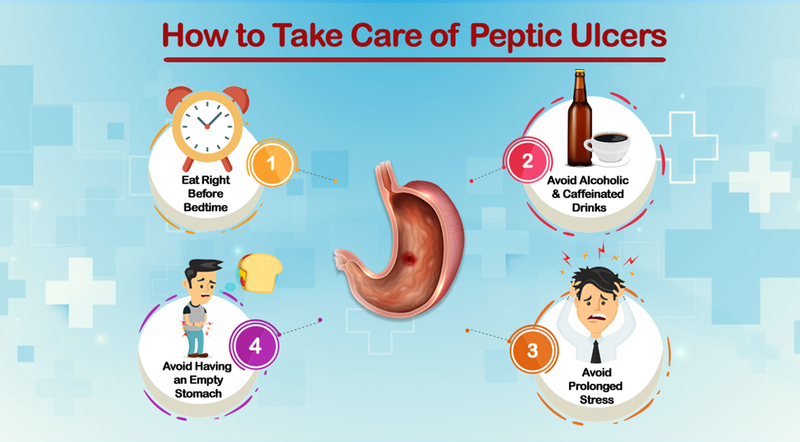 Here is a list of things that you are better off staying away from when suffering from a peptic ulcer. An Empty Stomach – Eating less may seem to be a good idea at first especially when everything you eat seems to cause unspeakable distress. However, an empty stomach awash with gastric acid can irritate an ulcer way more than any food you ingest. Take your pick from a list of therapeutic foods like yogurt, apples, berries and whole grains to fill you up as well as expedite the ulcer-healing process. Eating Right Before Bedtime – If you are in the habit of eating dinner right before you call it a day, you are inviting trouble as far as your existing peptic ulcer is concerned. As you eat, your gut starts producing gastric juices that are needed to digest the food. Gastric acid may stay in your stomach long after the food has been broken down, causing painful reflux later at night. Alcoholic and Caffeinated Drinks – Alcohol and caffeine both irritate the mucosal lining, therefore, worsening the effects of a peptic ulcer. It is better to avoid caffeinated beverages as well as alcoholic drinks while recuperating from a peptic abscess of any kind. Prolonged Stress – Psychological stress for an extended period is linked not just to an increase in the body’s susceptibility to Helicobacter pylori bacteria which is a primary instigator of peptic ulcers, but also to a diminished healing capacity. Avoiding overly stressful conditions can help in accelerating the recovery process. For more informational content like this, subscribe to our updates here.